I'm playing along with Sian's Memorandum Monday. I spent my weekend at a crop retreat. And the week preceding it purging my scrapbook supplies and making up page kits so that my time at the crop would be productive and worthwhile. I never really had a chance post-holidays to get back into any kind of routine. That starts today. Life should finally settle back to some semblance of normal. I actually finished all of the paper pages I had brought to work on and did a digi page from scrap as well! That left me time to update my planner, keep up with my Simple Abundance reading every day, get to the hotel gym twice!, keep up with my online classes, and do some light reading. 2. The weight it took you two full weeks to lose can be regained in just three days - despite getting to the hotel gym and making the best choices you could from the foods available. Ugh. I guess pizza and coke just can't be part of a weight loss plan. Bummer. 3. 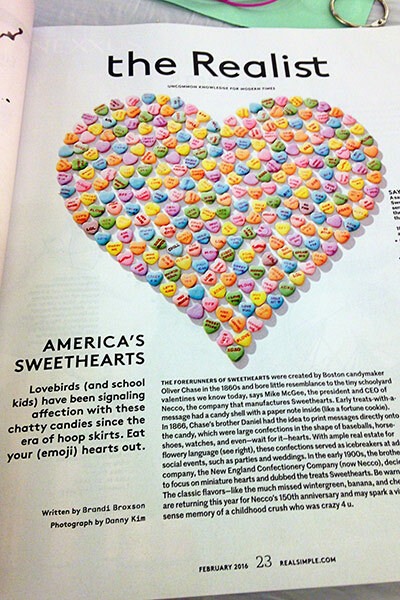 Did you know that the Valentine's candy "Sweethearts" has been around since 1866? Apparently the original version was much larger and had long flowery messages. The current miniature hearts with short messages first appeared in the early 1900's. What's even more interesting is how the messages have changed over the years. Who knew??? I used to love getting these candies at Valentine's as a kid. Now I wouldn't be able to tolerate the taste - but they are still fun! Did you get Sweethearts as a kid? Waving hello to all the Monday-ers! It's been years since I've been on a crop, and since I print photos at home as I decide what size I want them, I'm thinking a crop wouldn't help my backlog much. I was hoping to get to my Christmas Journal today, but I'm working on a Sketchbook Skool assignment, and then got distracted getting some cards into my OLW and FIT album. I love going to crops---but there just aren't any around here anymore. I do get away with my friends a couple times a year. I've always been a "pre-planner" and have found that's is the only way to be productive! As for the candy--I don't think anything says Valentine's Day quite as well as conversation hears! I would really like to go to a ladies scrap crop - oh what fun that could be. Sharing ideas, techniques & how everyone records their stories. Wishful sigh. I like your sharing of the history of candy grams. A great way to spend a weekend and organisation really does pay. I'm very much looking forward to my own crafty retreat in 6 weeks time. That's really interesting about the sweets. I had no idea they had been around so long. We know them as Love Hearts here. 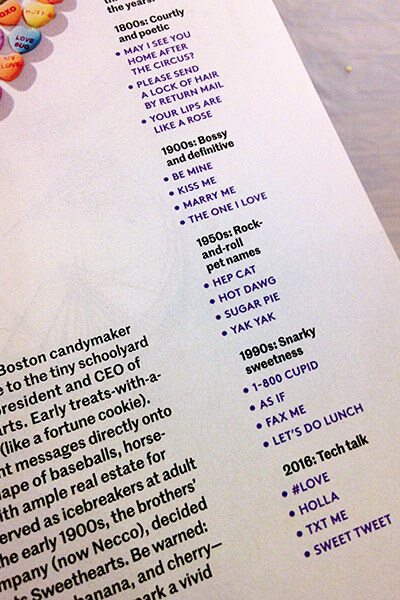 I love that list of changing messages on the sweets: that's really interesting. The ones we know as Lovehearts here are popular all year round: very fizzy and they taste like they are full of chemicals. I cropped two days in Austin last week, but my friend Amy provided really healthy meals for me and my friend LeAnne went for a walk each day and a workout in the hotel gym with me, so no weight gain for me. I finished (and am sharing on my blog today) my first layouts for the year. I have never been to a crop, I would love to go and just be able to concentrate all weekend. Hopefully the weight will fall off again! I've been doing art journaling lately and really enjoying it. But the scrapbooking bug will come calling again soon, I'm sure. I agree, planning is the key to getting lots done when going to a retreat. I loved love hearts when I was younger and am going to have to buy some tomorrow just to see what the messages are. I used to go to some crops - not in a hotel but with friends. We rented a house in Bodega Bay, did all our cooking and had lots of fun. I also prepared heavily for it and was surprised how much I got actually done. I like going to crops but always pack page kits - even when they are being flown internationally! I love the idea of going away with a bunch of friends for a weekend to hang out and play/scrap so have helped that happen several times. We used to do love hearts for Valentines Day - fun memories.